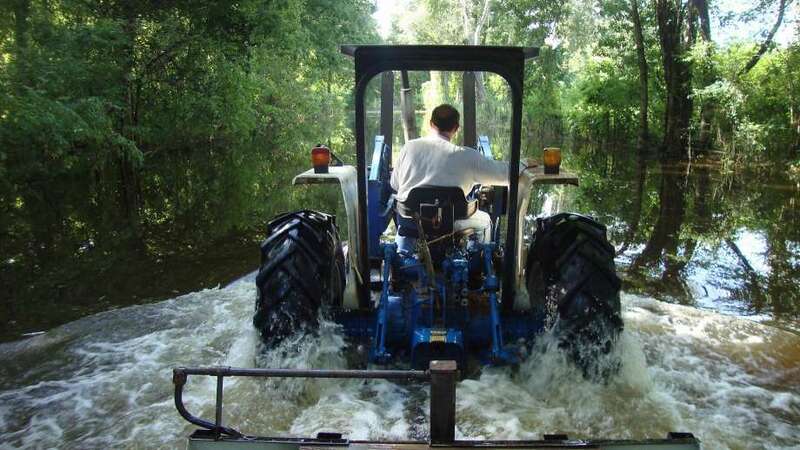 HOW TPP THREATENS OUR PROGRESS ON CLIMATE CHANGE | "Global Possibilities"
David Lester drives a tractor through a flooded street in Breaux Bridge, La. In the past month, wildfires forced tens of thousands of people across California to evacuate their homes. Over the same period, historic floods in Louisiana destroyed or damaged more than 60,000 homes, uprooting families and ruining lives. Whether fire or water, we know that human-induced climate change is making natural disasters more frequent and more intense. So why are some in Washington pushing hard for a policy that would make climate change considerably worse? This fall, Congress is likely to vote on the Trans-Pacific Partnership — an agreement among 12 nations along the Pacific Rim. While billed as a “free trade” deal, most of the TPP is actually about creating new rights for multinational corporations, including the big polluters most responsible for the climate emergency. Under the TPP, the biggest global firms — including many responsible for offshore drilling and fracking — would be able to sue American taxpayers over laws and regulations that are meant to protect public health and the environment. Rather than suing in regular courts, these corporations would, through the TPP, be able to sue before unaccountable arbitration panels — each panel made up of three corporate lawyers — who could award unlimited cash compensation. Similar rules in other trade deals have already made possible nearly 700 such lawsuits — including efforts to challenge the U.S. rejection of the Keystone XL pipeline and a moratorium on fracking in Quebec. TPP would allow multinational corporations that own gas-fired power plants from Alameda County to San Diego County to threaten state restrictions on carbon emissions — including some of the new world-leading standards recently passed in Sacramento. The deal would also vastly increase the number of fracking firms and offshore drilling companies that could challenge our protections. But it’s not about just dirtier air and water or more susceptibility to climate risks. It’s also about jobs. Because TPP would threaten a successful California rebate program for green technologies that are made in-state, the deal could result in the elimination of good-paying green jobs in fields like solar and wind manufacturing and energy efficiency. Green jobs employ all kinds of people — truck drivers, welders, secretaries, scientists — all across the state. These jobs can pull people out of poverty while protecting the planet. Given that California has lost an estimated 413,000 manufacturing jobs since America entered NAFTA and the World Trade Organization, we can’t afford to pass a new trade deal and again undermine people’s livelihoods. But there’s good news. Labor, environmental and social justice leaders now oppose the TPP, as do both major presidential nominees, House Democratic Leader Nancy Pelosi, and Senate Democratic Leader Harry Reid. Still, some in Washington are scheming to pass the TPP during Congress’s “lame duck” session after the election. While most members of California’s Congressional delegation firmly oppose the deal, some remain on the fence. As the consequences of climate change get clearer, the case against the TPP gets stronger. Van Jones is president and founder of the Dream Corps, and is a regular CNN contributor. You can reach Congress directly by calling (888) 701-6507 and let your representative know that you oppose TPP.